Spring is here and so are some of those pesky orchard invaders that like to feed and lay eggs in buds and fruitlets. I'm referring to Western flower thrips (WFT) and Campylomma. 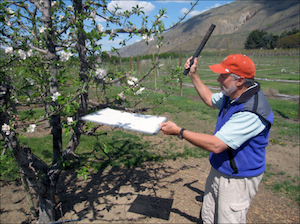 The best time to control WFT is at petal fall up to when fruit are 5 mm in size. Control of Campylomma requires a close monitoring for their presence starting before bloom and continuing up through petal fall. 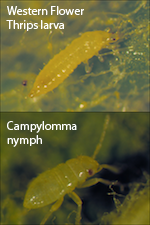 A new issue of our newsletter discusses both WFT and Campylomma Spring emergence and what you should know about management. It also covers the best method of monitoring for these pests using a beating tray and when to know its time to treat. Visit our newsletter web page to learn more. ¡Ahora también disponible en Español!